Mint, nane, is indigenous to the Mediterranean region and has been flavoring Turkish cuisine for centuries. Used to treat skin ailments by the ancient Romans and in funerary rites by the Greeks, the well known herb derives its English name from the ancient Greek mythical river nymph, Minthe. Associated with the river Cocytus, Minthe was punished for attempting to seduce Hades by his queen Persephone. Persephone turned Minthe into a plant so that everyone would walk all over her, crushing her for eternity. Hades, who had fallen in love with Minthe, was unable to undo the curse and in atonement gave her a pungent and sweet smelling aroma. Mint’s lamiaceae family of perennial herbs contains at least twenty-five different species of mentha including rosemary, thyme, oregano, peppermint, and spearmint. If cultivated from its own regenerating root-stock and if there has not been any introduction of foreign seeds, the specific nane in the Yedikule gardens has likely been grown for generations. 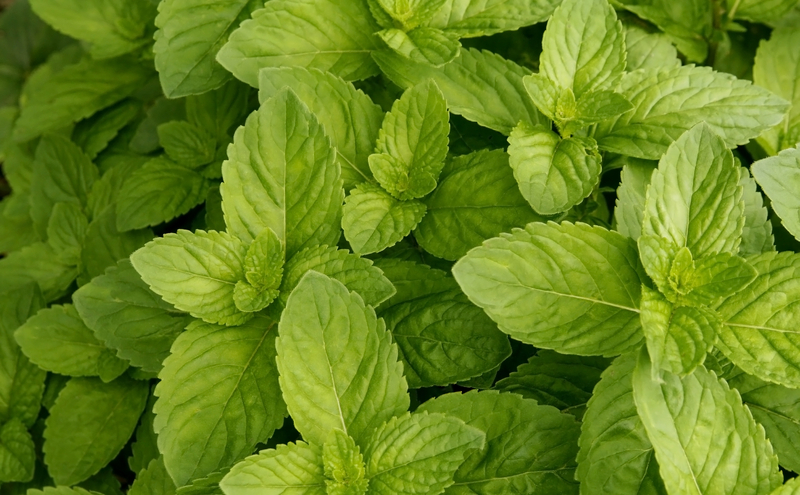 Spearmint is the preferred mint used for cooking. It is bright green, low growing plant with a square stem and jagged edged leaves that can be variegated and fuzzy. Both fresh and dried mint leaves and stems can be used for many different culinary and pharmaceutical purposes, but fresh leaves are usually preferred. Although it is not highly aggressive, mint’s tendency to grow unchecked have led some to label it invasive. Accordingly, growing mint is relatively low-maintenance. Wet environments and loamy, moist soils are considered best, and full sunlight is ideal. To grow outdoors one or two cuttings should be planted about two feet apart, and it should grow to be about one to two feet tall. Mint is susceptible to a few pests and diseases including powdery mildew, rust, and anthracnose. The Byzantine gardening manual Geoponika, includes a short discussion on mint in Book Twelve in which it “is thought to have no use.” A further examination of the text, however, reveals its many uses. Mint aids in vegetable and herb preservation, prevents “must” from overflowing in its storage vats and milk from curdling, promotes digestion, and repels pests. This ancient farming guide confirms the herb’s cultivation practices in its description. It likes temperate, dry air and a sunny site not shaded by trees. It grows underground and spreads. It is sown and planted. If sown it is harvested only in the third year, but if one plants the top of the root (the eye as some call it) from which the shoots grow, it can be harvested in the same year. The text’s description of growing techniques for mint and its superficial applications indicate that there was a wide variety of uses for the herb. The mint grown in the Yedikule bostans has smaller leaves that are bright green and smooth, but not fuzzy. Its taste is sharp with a cooling aftertaste and the plant smells minty while it grows before being harvested or crushed. Spearmint is the most common form of mint used for seasoning and is traditionally used in Turkish cuisine with yogurt in sauces and soups. The recipe for lentil and mint “Ezo Gelin Çorbası” or Soup of Ezo the Bride conjures nostalgia for a the beauty, aromas, and flavors of the Mediterranean in the midst of a gloomy winter afternoon. According to legend the recipe is remembered from the folk tales and songs of the young Ezo who died of a broken heart after marrying a man in Syria and leaving her homeland to join him. Her soup cures homesickness and reminds one to embrace past and future adventures. Add in the lentils, rice & quinoa (or bulgur wheat) and stir to coat in the tomatoey spices. Add the veg stock/water, season well with salt & black pepper, add the dried mint and bring to the boil. Turn the heat down, cover and simmer for 35-40 minutes everything is tender. If you like you can remove a ladleful of the soup and blend it until smooth, then add it back into the soup. This gives it a smoother thicker consistency. Add the sumac, taste for seasoning, add more salt or mint if necessary. Bring back to the boil. Serve in warm bowls sprinkled with chopped fresh mint leaves, a little sumac and some lemon wedges to squeeze over. A complete historiographical analysis of the economic and agricultural history of Istanbul and the Ottoman Empire includes various types of primary sources. This diversity helps to avoid misplaced assumptions or forgotten actors and draws a more complete picture of the past. Dominant power structures often write a history that reflects distinct motivations and intentions without considering many other perspectives. Less traditional primary sources like literary and artistic exphraxi, professional manuals and guidebooks, religious typica, and city surveys include important but perhaps underrepresented actors that contributed to the agricultural development of Istanbul. Mavroudi and Dolezal discuss the importance of exploring potentially problematic sources that require a significant amount of interpretation. For subjects that no longer exist, exphraxi can be useful tools through which to understand history. “The multiple allusions to divergent genres, in effect, contribute to more precise definitions of late Byzantine culture, not the least of which is sustained attraction to gardens, real or imaginary.” (Dolezal and Mavroudi, 2002) Alternatively, a quantitative analysis of city surveys and censuses can describe an increase or decrease in the amount of farms and gardeners in various neighborhoods within Istanbul. The very inclusion of bostans in a survey might indicate a type of centralized regulation and therefore a higher degree of control and oversight. This introduction of government presence to the management of urban farming demonstrates the role bostans have played as an integral part of city life. Similar to the exphraxis examined by Mavroudi and Dolezal, the Greek Byzantine Dioskorides’ Materia medica pharmacology encyclopediaand Geoponika farming manual have important cultural implications that inform the agricultural history of what is today Istanbul. In addition to the practical utility of farms and their crops’ nutrition, Book 12 of the Geoponika describes the intangible value of gardens and the importance of their proximity to residential zones. “Gardening is essential to life. For health and convalescence a garden should be developed not at a distance from the house, but in proximity to it, where it will give enjoyment to the eyes and pleasure to the sense of smell…” (Cassianus, 2011)Dioskorides similarly discusses the uses of plants medicinal qualities in the Materia medica. While neither document says anything about specific Byzantine gardens, they represent a vocal and visual discourse that indicates a high level of social and academic engagement with agriculture in the ancient empire. This commentary suggests that an “informed involvement in the everyday realities of plants and their medicinal uses” was expected from those that were responsible for the public good. (Brubaker) The significant cultural value given to these farms and gardens by these manuscripts may also be applied to the city’s gardeners. Creating a lucrative market for plants that could be grown in an urban environment for medicinal, hygienic, or superstitial applications and required a skilled gardener would likely have important social implications. Istanbul’s monastic typica also provide important information on the status of gardens and urban farms from the 12th through the 14th centuries. The typicon for the St. Mamas’ monastery in 1158 describes important connections between manual labor and spirituality that includes gardening and providing food sources for its monks. There is also an interesting community building element for the role of gardener and for the act of sharing meals. “Vine-dressers, gardeners and others working outside the monastery should take meals along with the other monks in order that ‘the name brotherhood may not be just a name.’” (Philanthropenos) The gardens of the St. Mamas monastery also provide most of the food eaten by the brothers. According to the document their diet consists largely of vegetables (mentioned no fewer than eight times), legumes, bread, fruit, cheese, and fish. While fish were probably bought elsewhere in the city, the explicit inclusion of “gardener” as a manual labor position indicates that monks grew at least some of the food. Furthermore, due to vows of poverty, one can infer that most sustenance items were made within the monastery’s grounds. The typica of the Convents of Lips and Sts. Kosmas and Damian are valuable in deciphering how much land was operated as working farms and gardens in Istanbul. The Convent of Lips included at least 18 hectares of operational gardens with an additional 74 hectares of arable land and about 17 hectares of vineyards “inside Constantinople” including Blanga and Galata. (Palaiologina) The Convent of Sts. Kosmas and Damian owns at least 2,342 hectares of arable land both inside (Blanga, Chalcedon, Galata) and surrounding (Philopation) the city as well as 92 hectares of vineyards and 24 hectares of olive trees. (Palaiologina) This substantial amount of land dedicated to agriculture speaks to the cultural and economic significance of gardening in Istanbul between the 12th and 14th centuries. The urban farms and agricultural history of the city requires creative interpretations of primary sources that may, at first glance, not seem to contribute directly to the historical narrative. The ephemeral nature of gardens as subjects need not inhibit thoughtful historical analysis. 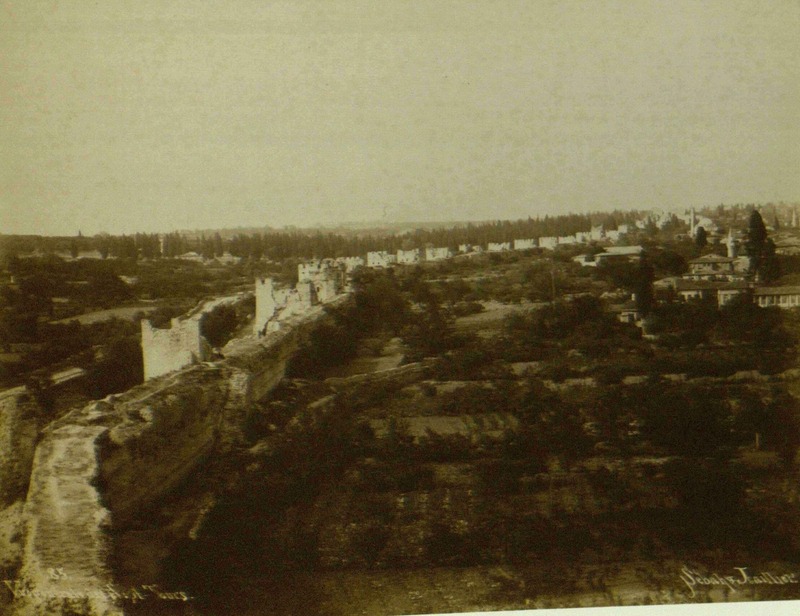 Most immediately obvious in deciphering the change over time of the Yedikule gardens is the substantial increase in commercial and residential development. Between the end of the nineteenth century and today the community green space and operational bostans have noticeably shrunk. 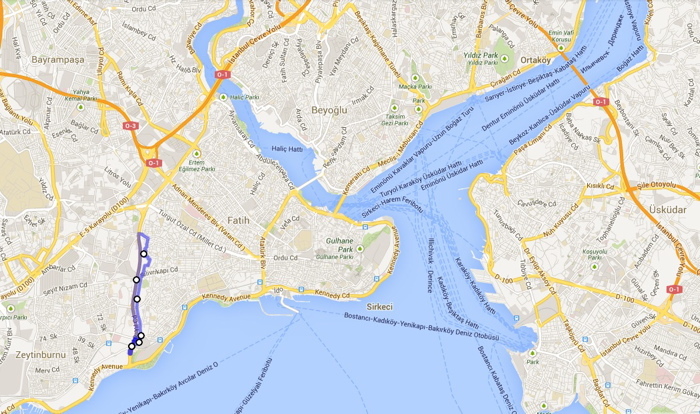 This reduction of urban farming in favor of an increase in commercial and residential infrastructure has significant implications for the cultural, social, and economic development of Istanbul. Located along the southern end of the fifth century Theodosian walls of ancient Constantinople, the bostans of Yedikule have operated for centuries as urban farms that supplied the city’s neighborhoods with fresh produce. As modern Istanbul erupted, urban developers have failed to recognize the immeasurable yet ambiguous advantages bostans contribute. In addition to food security, Paul Kaldjian notes that urban agriculture “minimizes the city’s reach into the countryside, increases the city’s self-reliance and sustainability, and reduces negative environmental and socioeconomic impacts on both urban and rural areas” (Kaldjian, 2004). Despite these benefits, however, developers in favor of Western style modernization marginalize bostans in order to create larger supermarkets, master planned parks and recreation facilities, and apartment buildings. 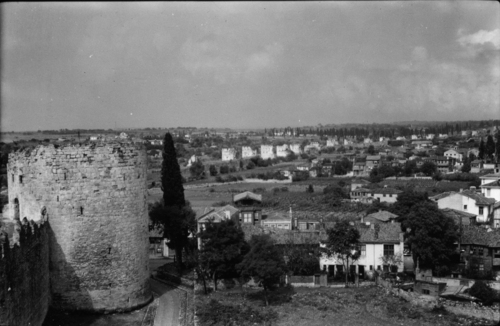 This series of photos illustrates the change over time of the Yedikule gardens that have historically complicated the traditional image of the consumer city identified by C.R. Whittaker (Whittaker, 1990). This photo from the 1890s depicts a lush, fecund landscape that features, in addition to many bostans, plenty of various types of trees and smaller bushes, and open, grassy areas. This flora extends in every direction, disregards the ancient wall, and weaves itself between the homes and mosques of the neighborhood. The landscape also follows the texture of the region. The hills and valleys are apparent, and the farms largely operate on appropriate levels, with the buildings filling in unobtrusively. Nicholas V. Artamonoff Collection, RV53, Image Collections and Fieldwork Archives, Dumbarton Oaks Research Library and Collection, Trustees for Harvard University, Washington, D.C.
Robert L. Van Nice Collection, 2012.0013.0031, Image Collections and Fieldwork Archives, Dumbarton Oaks Research Library and Collection, Trustees for Harvard University, Washington, D.C. The second two photos, taken in 1937 and 1938, respectively, are a shocking comparison to Sebah’s. Using the wall to orient oneself, it is obvious that number of bostans and green spaces have been significantly reduced. While a number of farms are still apparent, the intermingling of the natural landscape has virtually disappeared. The texture of the land has also been flattened. The only means of determining depth lies in the trees along the horizon. Houses and living spaces have encroached onto territory that was occupied by gardens and open areas less than 50 years earlier. The later picture below looks slightly greener due to the change in seasons. The second photo also shows similar trends in the reduction of green space on the western side of the wall. Today’s photo depicts complete destruction of the gardens to the East of the wall in favor of new apartment buildings and concrete buildings. The truly disappointing image shows land that has been left to decay as the space lingers in legal limbo waiting for city officials to either develop or return the land to its gardeners. While some kind of flora and vegetation extends north along the wall, it hardly provides respite from the vast urban sprawl. Although the perspective is lower than that of the preceding photographs, the buildings and houses seem to extend infinitely northward. Skyscrapers in the distance mark the landscape as a modern city. Changes in altitude may be noted by considering the rising buildings to the east. Istanbul’s dwindling historic green space, as depicted in these photos, is being destroyed by the consumer-oriented ideology of economic progress and development. Historically, the relationship between local bostans, their gardeners, and the neighborhoods they occupy has defied simplistic models of the consumer city. The artificial installation of modern development on top of the landscape is a disservice to the community. Supporting the natural generation of local produce and community green spaces instead will cultivate the unique culture and history of Istanbul.